Grettis saga Ásmundarsonar ( Modern Icelandic pronunciation (help·info)) (also known as Grettla, Grettir's Saga or The Saga of Grettir the Strong) is one of the Icelanders' sagas. It details the life of Grettir Ásmundarson, a bellicose Icelandic outlaw. The saga can be split into three major sections: Chapters 1-13, Chapters 14-85, and Chapters 86-93. The first and last sections of the saga focus on Grettir's family rather than on Grettir. Originally, the ill-tempered Grettir experienced some success, but his life takes a turn for the worst after he encounters the draugr Glamr in chapter 35. As a result of Glamr's curse, Grettir becomes disastrously unlucky, only grows weaker/never stronger, becomes afraid of the dark, and is doomed to loneliness, becoming an outlaw, and an early death. While in Norway in chapter 38, Grettir will accidentally kill a hut full of people by unintentionally lighting it on fire. In chapter 46, the Althing back in the Icelandic Commonwealth votes that Grettir is an outlaw because of the deaths this fire caused. This outlaw status forces Grettir to live on the edge of society and opens him up to being hunted by others. He is repeatedly betrayed by other outlaws and, after living 19 years as an outlaw, he will die a hunted man on the lonely island of Drangey in chapter 82. In chapter 77, it is stated that Grettir would have ceased being an outlaw after 20 years. Chapters 1-13 take place before Grettir's birth and focus on his father, Ásmundar, his grandfather, Thorgrim Grey-head, and his great-grandfather Önundur. Grettir's great-grandfather Önundur had been a viking/raider. In chapter two, Önundur lost his leg below the knee and became Önundur Tree-foot, while fighting from a ship against the Norwegian king Harald Fairhair at the Battle of Hafrsfjord. King Harald won the battle and united Norway into one kingdom. In chapter 3, those who fought King Harald fled Norway for Britain and Ireland. At one point, Önundur Tree-leg fought a battle against Kjarval, who was king around Dublin. In chapter 7, Önundur tree-foot visits southern Norway to assist kin. In chapter 8, he leaves Norway and arrives in Iceland to settle for good in chapter 9. Önundur dies and is buried in tumulus in chapter 11, after which the saga's focus shifts to his son Thorgrim Grey-head and his son Ásmundar Grey-hair. Asmundar fathers Thorstein Dromund while visiting Norway in Chapter 13 and then returns to Iceland. Grettir's life is told from beginning to end. Chapter 14 describes Grettir's immediate family. Ásmundar Grey-hair and his wife Asdis have two boys: (1) the eldest brother, Atli, is quiet and gentle, and (2) Grettir, is rebellious, bad-tempered, and mischievous. He is described as red haired, somewhat freckled, and broad around the eyes. They also have two daughters: (3) Thordis and (4) Rannveig. In this chapter, it is stated the Grettir's father did not care for him much but that his mother loved him alot. It is also revealed that Grettir grew strong and that he has a fondness for poetry. In chapter 16, Grettir receives his first sentence for outlawry. While still very young, Grettir kills a person because he thinks they have taken his food bag. Despite attempts to pay compensation to the family similar to weregild, he is temporarily banished from Iceland and sentenced to lesser-outlawry for three years. He asks his father for a sword before he leaves, which his father refuses, but his mother Asdis gives him family heirloom sword from her familyline in chapter 17. He then leaves for Norway for the first time. In chapter 18, Grettir fights his first creature, an undead man, Kar, guarding treasure in his own funeral mound/tumulus. Treasures and weapons are taken from the mound after Grettir's triumph. He has other successful adventures in Norway as well, killing bears and berserkers. He then has to flee Norway to go back to Iceland after he kills people for an insult in chapters 23 and 24. Grettir comes back to Iceland. In Chapters 32-33 a Swedish, pagan shepherd named Glámr is asked to watch sheep, but disappears on Yule/ Christmas eve. He is seen dead the next day in the snow and then Glamr will become a draugr that haunts the area. Grettir will fight and successfully slay Glamr in chapter 35. Glamr's curse is what leads Grettir in a different direction. As a result of Glamr's curse, Grettir becomes disastrously unlucky, only grows weaker/never stronger, becomes afraid of the dark, and is doomed to loneliness, becoming an outlaw, and an early death. While in Norway for the second time in chapter 38, Grettir will accidentally kill a hut full of people by unintentionally lighting it on fire. His older brother, Atli at the family farm will get killed by a man named Thorbjorn in chapter 45. In chapter 46, the Althing back in the Icelandic Commonwealth votes that Grettir is an outlaw because of the deaths the fire caused. Grettir returns home to Iceland the following chapter, 47, to learn this information for the first time. This outlaw status forces Grettir to live on the edge of society and opens him up to being hunted by others and being betrayed by other outlaws. Grettir lives in various places running from enemies and slaying more monsters. In Chapter 69 he returns home to the farm at Bjarg and sees his mother. She sends him off with his 15 year old brother Illugi and they head off to spend the rest of the saga on the island of Drangey off the northern tip of Iceland. Part of the reason for this if that the island has steep cliffs and can only be climbed up on with the help of a ladder than can be withdrawn. Grettir eventually becomes the longest-surviving outlaw in Icelandic history. After spending over 19 years as an outlaw, his friends and family ask for his banishment to be lifted, arguing that a man could not spend more than 20 years as an outlaw according to the law (in fact, there was no such law in medieval Iceland). In chapter 77, after a debate at the assembly, it is decided that the outlawry will be lifted when he has completed the 20 years but not before. His enemies make one last effort, using sorcery to cause him to wound himself and finally defeat him, atop the cliff-sided, lonely, fortress-like Drangey off the northern tip of Iceland where he was staying with another brother of his named Illugi, and his slave Glaumur. Grettir's enemies succeed in killing him in chapter 82. Assuming that the tales of the saga bear any relationship to historical realities, Grettir would have died 'some time between 1030 and 1040'. His half brother, Thorsteinn Dromund, later avenges him in a semi-comic scene in Byzantium/Constantinople, where the Norse served as Varangians. While in Constantinople, he falls in love with a married woman named Spes, who helps him. After Thorsteinn Dromund completes his mission the two of them decide to spend the rest of their lives in monastic cells in Rome. Grettir Ásmundarson was reported to have been from Bjarg in Miðfjörður. At Bjarg, Grettir Ásmundarson always had refuge with his mother Ásdís. Many place names in the neighbourhood of Bjarg and indeed throughout the county bear the name of the outlaw e.g. Grettishaf, Grettistak and Grettishöfði at Arnarvatn. Even Garfield is named Grettir in Iceland: because he is rufous, a little broad and unwilling to conform to society's norms. A memorial was erected to his mother Ásdís at Bjarg in 1974. The memorial displays a relief from Grettis Saga made by Icelandic artist Halldór Pétursson. Grettir is celebrated in the long poem Eclogue from Iceland in the 1938 collection The Earth Compels by Irish poet Louis MacNeice, who had developed a love of Norse mythology while at school at Marlborough College. In it, the ghost of Grettir speaks with two men, Craven and Ryan, who have been 'hounded' from a decadent and war-threatened Europe 'whose voice calls in the sirens of destroyers'. He urges them to recover their underlying human values, and to assert, as he has, 'the sanctity of the individual will'. He tells them to return home as an act of duty, which he calls - remembering his own defiant choice to be an outlaw - 'Your hazard, your act of defiance and hymn of hate, hatred of hatred, assertion of human values' and (in the poem's final words') 'your only chance'. The Australian composer Percy Grainger described the Grettis Saga as the "strongest single artistic influence" in his life. The saga was adapted in 2017 as the basis for a novel set in Sheffield by Tony Williams (author). ^ The Story of Grettir the Strong, Ch. 35, trans. by Eiríkr Magnússon and Willam Morris (1869). ^ The Saga of Grettir the Strong, trans. by G. A. High, ed. by Peter Foote, Everyman's Library, 699, repr. (London: Dent, 1965), p. v.
^ The Story of Grettir the Strong, Ch. 84, trans. by Eiríkr Magnússon and Willam Morris (1869). ^ Tony Williams, Nutcase (Salt, 2017), ISBN 978-1-78463-106-2 (UK edition). Grettis Saga Ásmundarsonar, a critical, annotated scholarly edition by R. C. Boer (in German). 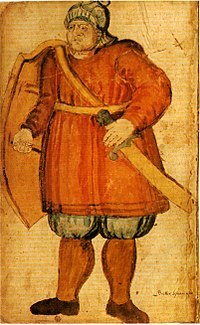 Gísla saga - Another Icelandic saga with a main character who becomes an outlaw. Russell Poole, "Myth, Psychology, and Society in Grettis saga," Alvíssmál 11 (2004): 3–16.